You may have noticed I haven’t posted for a while. I have been sick with a terrible cold. I am getting over it and decided I needed a treat. 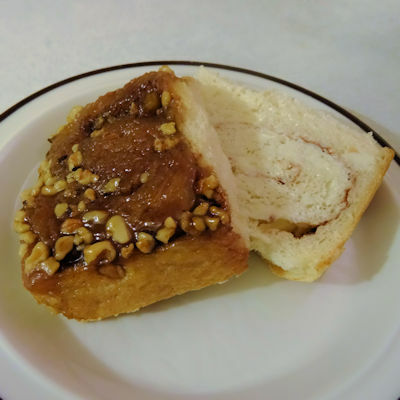 So, I made Caramel Apple Rolls. I started by mixing 2 cups flour, 2 packets of yeast, 1/3 cup sugar and 1 teaspoon salt together. I put the butter in the water and heated it to 120 F in the microwave. The butter won’t be totally melted but that is not a problem. Add the liquid ingredients and an egg to the dry ingredients and mix with the paddle attachment on a stand mixer. Beat for 2 minutes. Add 2 1/2 cups flour and change to the dough hook. Mix with the dough hook for 2 minutes, scrape the bowl and mix for 8 minutes more. Turn the dough out onto a floured counter. Need 3 or 4 times until the surface isn’t sticky. Form the dough into a disc and cover with a dry towel. Let it rest for 10 minutes. Mix 1/2 cup butter, 1 cup brown sugar and 1/4 cup light corn syrup in a small saucepan over medium heat. Stir until the mixture comes to a boil. Boil for 30 seconds. Divide the syrup between two eight by eight cake pans that have been sprayed with baking spray. Divide 1/2 cup of chopped walnuts between the two cake pans. Press and stretch the dough to a 10 by 15 inch rectangle on a floured surface. Spread 3 tablespoons of soft butter over the dough. Mix 1/3 cup of sugar and 1 teaspoon of cinnamon together. Sprinkle the mixture over the rectangle. Spread a medium apple that has been peeled, cored and chopped over the rectangle. Roll the rectangle along the long edge and seal the seam. Cut the cylinder into 12 equal slices with a sharp knife. If the knife starts to stick, run it under warm water before the next slice. Put six slices in each cake pan. Cover the pans with a dry towel and let the dough rise in a warm place until doubled in size, about 1 hour. Cook the buns in a 350 F oven for 30 to 35 minutes or until the roll are golden and the internal temperature measures over 200 F.
Let the pans cool for 5 minutes. Run a knife around the edge of the pan. Turn the pans over on a plate and lift the pans off. If you would like to see a video of this cook, here it is! 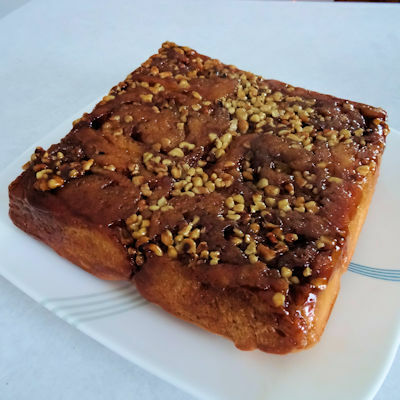 These have a wonderful caramel topping, the bread is soft and spongy and the apples give it a tart sweetness. They really raised my spirits despite the cold! Mix 2 cups flour, the yeast, 1/3 cup sugar and the salt in the bowl of a stand mixer. Put the water and 6 tablespoons butter in a microwave proof container and microwave until just getting hot, 120 F. The butter will not totally melt. Add the water and butter and one egg to the dry ingredients and mix with the paddle of your mixer. Beat for 2 minutes. Add the 2 1/2 cups flour and change to a dough hook. Mix for two minutes. Scrape the bowl and mix for 8 minutes more. Put the dough on a floured surface and need 4 or 5 times until the dough isn't sticky. Cover the dough and let it sit for 10 minutes. Put the 1/2 cup butter, 1 cup brown sugar and corn syrup in a small saucepan over medium heat and stir until it boils. Boil for 30 seconds. Divide the syrup between two 8 by 8 inch square cake pans that have been sprayed with baking spray. Divide the walnuts between the two pans. Stretch and press the dough to a 10 by 15 inch rectangle. Spread the 3 tablespoons of soft butter over the dough. Mix the 1/3 cup sugar and 2 teaspoons cinnamon together. Spread the mixture over the dough. Spread the chopped apples over the dough. Roll along the long edge and pinch the seam closed. Cut the roll into 12 even slices with a sharp knife. Rinse the knife under warm water to prevent sticking. Put 6 slices in each cake pan. Bake in a preheated 350 F oven for 30 to 35 minutes, until golden and the internal temperature is 200 F.
Let the pans cool for 5 minutes. Run a knife around the edge and turn the pans over on a plate. Lift the pans off. Yummy! I am glad you are feeling better! Thanks, Carlee. It is being a long illness. Oh! my! I’m certainly ready for some of these. They look fantastic and bet they taste even better than that. Now I need to get busy and make some of these. I sure hope you’re feeling better. Thanks, Sam. It is one of those coughs that just will not go away!